Treating Depression With Light | Chapter 3 of Brighten Your Life, an eBook by Daniel F. Kripke, M.D. By Daniel F. Kripke, M.D. Here is good news for depressed people! You can often make yourself happier simply by lighting up your life! With some advice from your doctor, you can relieve depressive symptoms by getting more bright light. Just as darkness makes us sad, bright light tends to restore us to a normal level of cheer. This simple and very helpful principle helps us treat depression. You can help depression by spending more time outdoors in daylight, but to be frank, changing habits to experience more daylight is often not practical in today’s world. That is why we usually recommend increased artificial lighting. This section will explain how bright light treatment is used, but if you have significant depression, you should check with your doctor. People vary in how much bright light they need to combat depressive symptoms. There must be many factors, including how depressed a person is. A modest increase in lighting may help with a mild problem. A more severe problem may need much brighter lighting and a longer duration of bright lighting to overcome. The amounts of light needed should at least bring a depressed person above the average for daily light exposure. This can be achieved with as little as 30 minutes of very bright light near 10,000 lux (like sunshine) or with a couple hours of light of about 2500 lux (like a cloudy day or deep shade). If the amount of depression is substantial, light much dimmer than 2,000 lux may not be very effective without many hours of daily exposure, though in the chapter on advanced sleep phase, I will describe how modest amounts of lighting may be sufficient for certain sleep problems. We have to admit that the information doctors now have about the effectiveness of different lighting dosages is quite fragmentary. We really cannot give very exact advice about what brightness and duration of light a particular person should use. (Incidentally, doctors have a similar problem in recommending the dosage needed of antidepressant drugs or the amount of psychotherapy needed.) Thus, for the present time, somebody who wants to use bright light might need to try to see empirically how much light is needed. Using light treatment for up to several hours a day might be beneficial at the beginning of treating serious depressions. Most people would be able to decrease the duration of treatment after a satisfactory response was obtained. Initial durations of 30 min. for 10,000 lux or 2 hours for 2–3,000 lux are often satisfactory. I would be uncertain of the safety of increasing the brightness of light treatment above 10,000 lux, so I never recommend any brighter treatment. The decision about whether to try 10,000 lux for a shorter time or 2,000–3,000 lux for a somewhat longer time depends on several considerations. Most people prefer the brighter light for the shorter time because of the convenience of shortening the time required. However, using 10,000 lux does generally require getting close to the light source, which may be awkward in some settings where it is convenient to use a lower intensity for a longer time. A full 10,000 lux will also make some people’s eyes uncomfortable or increase headache and eyestrain. Theoretically, we would expect 2,000 lux to be safer for the eyes than 10,000 lux, but 10,000 lux has been tested enough now without causing any eye damage that most experts seem quite confident of its safety. After all, 10,000 is no brighter than what we normally experience when we spend time outdoors on a bright day. People have been testing 10,000 lux for longer than recorded history. I will describe just how to provide this bright light in another section below. Like many other habits – eating, exercising, and sleeping, for example – a person may need to try different amounts of bright light to discover how much is best individually. If a half hour a day is not doing enough after a couple of weeks, try one hour or two hours. If 2000 lux is not doing enough, try 10,000 lux. Although some people will experience some mood improvement within an hour of a single dose of bright light, it often takes a week of daily bright light treatment for a severely depressed person to feel a measurable improvement, and increasing benefit may be felt as treatment continues for at least 8 weeks. Unfortunately, we do not have adequate controlled trials of treatment longer than 8 weeks, but that is true of many antidepressant drugs as well. It is likely that continuing improvement or prevention of relapse will continue for many months. One should not become disappointed too quickly, especially if even slow improvement is seen. On the other hand, it is possible to use too much bright light. The dosage in time or brightness sometimes needs to be adjusted and reduced. Eyestrain, headache, irritability, and sleep problems may be signs of excessive treatment. In a later section, we will consider some specific side effects on sleep and mood which may require reduction of dosages. For many people, bright light at any time of day will help depression. It appears that most people will get the best benefit from bright light very early in the morning, even starting an hour before the usual time of awakening. However, there is a smaller group who seem to benefit more with evening light. I think it is the sleep pattern which provides the most useful clinical clue to optimal timing. The principles for optimizing light timing from sleep patterns are simple. If a person tends to have trouble falling asleep and has trouble getting up on time each morning, that person is likely to do best with using bright light early in the morning. People whose depression is linked to sleeping more may also tend to do best with light in the morning. For such people, using bright light immediately after awakening is the most effective time to use bright light. Indeed, some studies suggest that getting up a bit early to use morning bright light increases its benefit. Dr. Terman recommends beginning morning light treatment about 2 ½ hours after the middle of sleep. For example, if a person sleeps from midnight to 8 AM (with midsleep at 4 AM), the recommended time would be 6:30 AM. In contrast, evening bright light may be best for the person who tends to nod off early in the evening, who cannot stay awake for prime time television, and who awakens earlier than desired in the morning. For the person who does not fit clearly into either of these patterns, there might be little difference between morning and evening bright light treatment, but morning light would be the better bet. We will explore these principles in more detail in the section on advanced and delayed sleep phase syndromes. For the person suited for morning light, a way to get fast relief is to use wake therapy. The way to use wake therapy is to get up in the middle of sleep, turn on bright room lights, and stay awake for the second half of the night (e.g., a person who sleeps from midnight to 8 AM would get up at 4 AM). Then, bright light treatment is commenced near the normal awakening time. Most depressed people experience surprising relief of depression after getting up so early, provided they stay awake all day despite some increased sleepiness. Although patients who are not using bright light tend to relapse after wake therapy as soon as they sleep again, with bright light treatment, the rapid gains of wake therapy are often maintained. I believe that a single night of wake therapy (getting up in the middle of the night) is helpful and practical at the beginning of light treatment, and getting up a bit early thereafter might help. A special case are the patients with bipolar disorder (a history of being manic depressive), especially those whose mood cycles rapidly between mania and depression. These patients may be prone to trigger unwanted and serious mania with use of bright light, especially in the morning, or with wake therapy. Mid-afternoon bright light may be the best for these patients, according to preliminary testing. I do not recommend wake therapy for bipolar patients, because of the risk of mania, unless they are in a doctor's active care. Please see below, in Chapter 7, the warning against manic-depressives using light or wake therapy without a mood stabilizer. The most important aspect of treatment lighting is that it be bright. So far as we know, sunlight and artificial lighting work equally well. However, in various climates, environments, and social situations, using sunlight may be impractical, so most people will need to buy, rent, or borrow special artificial lighting. So far as we know, both ceiling lighting that hits the eyes and lighting level with the eyes work equally. There is some indication – not yet proven clinically – that light coming from below (e.g., a light on the floor) would not work as well. So far as we know, diffuse incandescent and fluorescent light of equal brightness might work equally, but there are two important advantages with fluorescent fixtures. First, since fluorescent lighting is more energy-efficient, you pay for less electricity and produce less wasted heat with fluorescents. That heat could be annoying in the summer. Second, fluorescent tubes are large, so it is easy to diffuse the light over an area of several square feet. This means that unlike the very bright point of light produced by incandescent bulbs, fluorescents produce somewhat dimmer light over a larger area. When the light goes through the lens of the eye and hits the retina (the back of the eye), the energy of diffuse light is spread over a large area, so it should not heat the retina or make you see spots (like the spots you see after looking at a flash bulb). Diffused bright light is safer for the eyes and will cause less strain. As a general rule, you could not burn your retina by staring at any of the common fluorescent bulbs with diffusers, even if you are receiving 10,000 lux. Obviously, nobody should stare at a light if it hurts or seems to dim the vision. Some people are annoyed by the flicker or sound of older fluorescent ballasts, so fluorescent fixtures with electronic (high frequency) ballasts will probably cause less headache and sense of eye strain. Avoid the older models flickering with the 60 cycles household alternating current. I am not certain that staring at very bright incandescent bulbs is entirely within the range of safety. I would never recommend that anyone take any unnecessary chances with their eyes, so I feel that nobody should treat themselves by looking directly at bright incandescent light (such as 300 watt halogen bulbs) without diffusers. Indirect incandescent lighting or lights with large diffusers or shades should be safe, as I will discuss in the section about using lighting for the elderly. The problem with using indirect incandescent lighting for treating depression is that the standard commercial lamps lose most of the brightness by bouncing the light off the walls and ceiling, partly because the light travels a greater distance. As a result, the lighting store “torchiere” incandescent lamps are probably not bright enough to do the job well for serious depressions. Another problem is that the 300–500 watt halogen incandescent bulbs used commonly do not last very long and may be a bit difficult to replace. For these reasons, all of the lighting fixtures which I can currently recommend for significant depression use fluorescent bulbs and diffusers. Recently, there have been technologic developments with LED lighting. LEDs are more energy-efficient than even fluorescent bulbs, and they will last longer. However, except for a few studies with the “Litebook” brand LED devices, which have been shown to have beneficial effects as compared to placebo, there has been relatively little testing of the white LED devices. 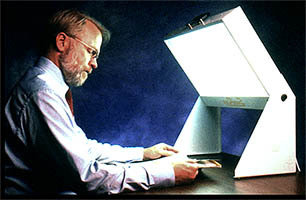 Some of the products such as Litebook models use LEDs to produce intense white light from a rather small area, which might produce more glare or discomfort. I am not aware of sufficient testing to make me as confident of these LED treatment devices as the fluorescent designs. The truth is, there have been virtually no controlled comparisons available between different models and brands. New research has shown that the “photometer” cells in the retina of the eye which respond to brightness (the intrinsically photosensitive retinal ganglion cells) are most sensitive to blue and blue-green light. These cells contain a special visual pigment called melanopsin which responds best to blue. On the other hand, there also seems to be a benefit in additional colors of light, such as some green mixed with the blue. The issue is complicated by the fact that the lenses in our eyes turn yellow as we age, so that blue light does not reach the retina as well as green or yellow in older people. There have been several studies which suggest that blue LED light of only moderate intensity will influence the circadian system more than white light of the same intensity. The hope is that blue light which seems less bright and requires less electricity could be as useful as brighter white light. However, this advantage of blue light may not hold in middle-aged and elderly people. Moreover, I know of no evidence that blue light works better than white light for treating problems with mood. Although the blue LED devices are thought to be safe, their margin of safety may not be as great as with white light, because animal studies show that blue light can be much more damaging to the retina. All in all, as of 2012, I am inclined to feel more confidence with the white fluorescent models. There are now a large and confusing number of light treatment models and manufacturers advertised on the internet. Several manufacturers (listed in the box below) make fluorescent fixtures which do a very nice job of helping depressed patients. A good place to find lighting manufacturers is at the website for the Society for Light Treatment and Biological Rhythms. In general, 160–300 watts of fluorescent light illuminating a bright diffuser about 1 yard from the eyes will give about 2,000–3,000 lux. The exact brightness depends on various aspects such as the bulbs, the diffusers, and the reflectors. To get 10,000 lux, the manufacturers may recommend a somewhat bigger fixture with more wattage or placing the fixture closer to the eyes, perhaps 12" to 18". There is considerable difference in the brightness of different models, so the dimmer models may need to be closer to the eyes. Some of the designs hold the light tilted a bit above the eyes, which seems to be convenient for getting light treatment and also getting something done reading, writing, eating or watching TV. Some researchers have recommended that people stare at the fluorescent diffuser most of the time when they are getting the treatment. Others have recommended glancing at the light every minute or two. Others seem to feel that having the light source anywhere in the field of vision (even if you aren’t looking at it directly) is just as good. Unfortunately, we really do not know yet whether it makes much difference whether you look directly at the lighting. Most evidence suggests that having the light within the field of vision and glancing at it occasionally is sufficient. Also, unfortunately, we really do not know if it makes a difference where the light is during treatment: above the eyes (tilted), straight in front, to the side, or even below where the person is looking. There is some evidence – not fully convincing – that light slightly above or even with the eyes would be more effective than light coming from below where the eyes are looking. I wish we had some sort of independent testing of different brands and models of bright lights, to see which ones helped depressed people the most. We do not. Comparative testing would be difficult and expensive, so almost none has been done. I suppose that all of the fluorescent light boxes quoted to give the same brightness are likely to be roughly equivalent, but I do not really know. A lot has been written about natural lighting and whether one should use lighting with a “full” spectrum. I suspect this spectrum of claims is largely baloney! In fact, the FDA forced one company advertising “full spectrum” light into a consent decree admitting that their claims were deceptive. First of all, almost any white light produces the full visible spectrum of colors (light wave lengths). The question is the balance of the different wavelengths, which does differ from one light source to another. If one looks at the fine spectrum with a precision spectrophotometer (which measures the color balance of light exactly), I doubt that any of the commercial sources really produces a light spectrum which could be mistaken for the rather smooth spectrum of natural sunlight. Fortunately, the eye is not a spectrophotometer, and there is no evidence that the sunlight spectrum is necessary. The main issue is how much ultraviolet light the light source produces, because some of the “full spectrum” bulbs give off enough ultraviolet to possibly increase cataracts or skin cancer. There is no evidence that the ultraviolet is needed for the bright light treatment benefit, so needless to say, I do not recommend anything with significant ultraviolet. Most of the fluorescent manufacturers use a plastic diffuser which filters out the harmful ultraviolet. There is more discussion of the risks of ultraviolet in the chapter about risks. It is true that many Americans get so little ultraviolet sunlight in the winter that they become vitamin D deficient, especially when fear of obesity unwisely persuades people to avoid Vitamin-D-fortified dairy products. It is sun striking the skin, not the eyes, which helps with Vitamin D, so if you are going to a tanning saloon for Vitamin D, keep the ultraviolet out of your eyes. Then light up your eyes without the ultraviolet. Anyone concerned about vitamin D would probably be wiser to buy some in the grocery store than to try ultraviolet lighting to prevent vitamin deficiency. Dairy products can be good for you. Did you know that you might actually get depressed, if your cholesterol is too low? There has been a good deal of hoopla and advertising about light visors. The idea is that if you could wear the light source on your head like a baseball cap – and get bright light treatment without blinding yourself – it might be easier to go about your business. I never recommend light visors, because I am not the least bit convinced that they work for treating depression. In fact, there have been several studies suggesting that various light visors which have been tested do not work better than ineffective dummy treatments. Apparently a more promising approach to making light treatment easy is providing light exposure during sleep. There is some evidence that gradually increasing light toward the end of the night, simulating dawn, has a useful effect. I do not think that the dawn simulation idea has yet been proven superior to using a steady intensity of light during sleep. There has not yet been sufficient research on this technique from different laboratories. I do not recommend trying dawn simulation unless it is quite impossible to arrange for sufficient light when you are awake, but some manufacturers provide dawn simulation devices, if you want to take a chance on trying light before waking up. Light before waking up is a form of morning light, and it probably will work best for people with trouble falling asleep and with trouble getting up on time. If you tried bright light and you felt better, what do you do next? Many people should keep using light. Often, our need for bright light is not temporary. Depression may be a long-lasting problem, not temporary like a sore throat. If you need supplemental light, you may need light supplements for years, or at least until your habits change. You would not expect your need for food or exercise or sleep to be temporary. You would not expect a rose bush to need time outdoors only occasionally. For roses, light can be a life-long need. For some people, a need for light might also be life-long. Therefore, some people who benefit from bright light need to use bright light almost every day for years. If they stop using light, after a few days or weeks, they may relapse and become depressed again. We do not think the need for bright light is like the addictions, where addicts must increase their doses as they develop tolerance. In fact, people often find that they need less time with their light box to avoid relapse than they did initially to make the depression go away. Perhaps light is like taking aspirin for arthritis: if an arthritic stops taking the aspirin, the old joints could start aching again! Perhaps for some people, using light may be like taking insulin for diabetes: if a diabetic stops taking the insulin, the blood sugar problem will probably reappear. If a person has been depressed for the first time, and after using bright light has felt well for a good time (not less than two or three months, I would think), it could be reasonable to try slowly reducing the light dosage, to see if symptoms recur. You should think twice about reducing the dosage if your mood is not completely satisfactory, and you are still having some depressive symptoms, because then relapse is more likely. Be alert to the possibility that you could reduce your lighting dosage and feel well at first, but that relapse of depression could occur weeks or months later. Restoring light dosage might become necessary even several months or more after light treatment is cut down. It would be safer for most people to cut their light dosage in half for a month before stopping bright light usage completely. An exception might be people with winter depression who have learned that their symptoms stop at a certain time of year. However, experience teaches that even winter depressives often need light year-round. Brighten Your Life, in all its formats, including this eBook, copyright ©1997-2018 by Daniel F. Kripke, M.D. All rights reserved.